Freechoice: Take a walking tour of this magnificent city, famously dominated by the impressive Palais des Papes (Popes Palace). During your walking tour stroll through the cities ancient ramparts and narrow streets seeing the Popes Palace and St. Benezet Bridge, the famous Pont d’Avignon. Alternatively, sample the celebrated wines of Châteauneuf-du-Pape at a Côtes du Rhône vineyard. Freechoice: Shop with a Chef at a local food market and cook up a storm in Scenic Culinaire with your fresh ingredients. 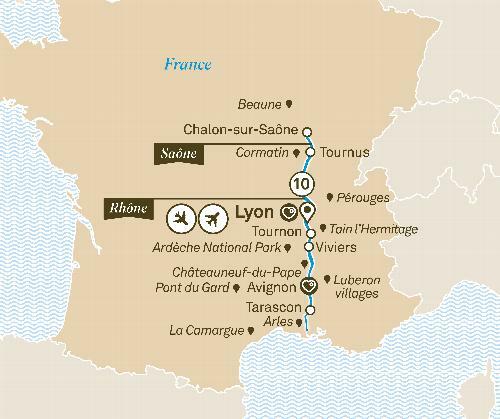 Alternatively, drop into the villages of the Luberon region including Gordes and the nearby Sénanque Abbey, or take an excursion to Uzès and Pont du Gard, the impressive Roman aquaduct. Freechoice: Explore the artistic heritage of Arles, and see the striking Arles Arena, or stop in at the pretty hilltop village of Les Baux before touring a charming family-run olive farm. Alternatively, pay a visit to Saint-Rémy and Saint-Paul de Mausole Monastery where Van Gogh was held for a year or take an active walk and embrace the natural scenery of La Camargue National Park.